Peel cucumbers. Halve lengthwise, remove seeds with a spoon, and cut into 2 cm/0.8 in.- thick slices. Peel and finely dice potatoes. Chop dill. Peel onion and cut into thin slices. Heat some vegetable oil in a pot and sauté onion for approx. 2 min. Add potatoes and cook for approx. 5 min. Add cucumbers and some vegetable stock, cover, and cook for approx. 10 min. more. Meanwhile, melt butter in a saucepan. Add sugar and flour. Cook over medium heat for approx. 1 – 2 min until foamy. Deglaze with remaining vegetable stock. Whisk in mustard, vinegar, and mustard seeds. Season with salt and pepper to taste. Add half of the chopped dill and whisk until well combined. Add the sauce to the pot with cucumbers and potatoes. Stir until well combined. Cover and cook for approx. 10 min. more. Season both sides of the pike perch fillets with salt and pepper. Wrap each fillet up with one slice of bacon. Heat remaining vegetable oil in a frying pan set over medium heat. Fry the fillets for approx. 3 – 4 min. on each side. Turn off hear and let the fillets rest in the pan for approx. 5 min. 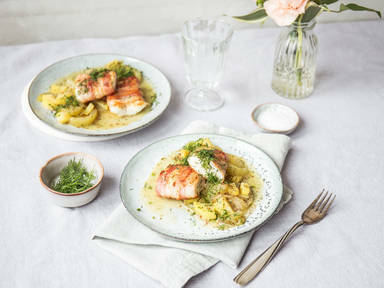 Serve the pike perch fillets over the cucumber-potato salad. Season with salt and pepper to taste and garnish with the remaining dill. Enjoy!